Recently established in 2012, Drake Casino offers a generous welcome bonus and is accessible through computers and mobile devices. 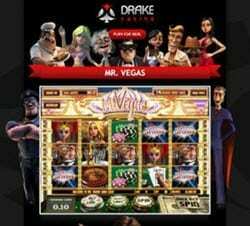 Powered by Betsoft, Arrow’s Edge, Drake Casino has access to exceptional software delivering incredible audio features, superior graphics, and unique animations. Fantastic bonuses and promotions also add to the excitement of a visit. True to form, you can expect a lot of classic slots, including such well-known titles as Triple Crown, Aztec Treasure, Captain Cash, and Back in Time. A large selection of 3D bonus video slots, offering innovative gaming not found with traditional slots and table games, increase the fun of playing with titles like Arrival, Viking Age, and Mr. Vegas. 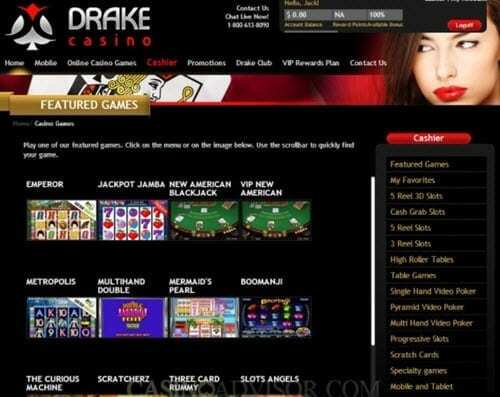 Popular video poker games are featured at Drake Casino just like any other online casino. The current selection contains a lot of traditional titles such as Deuces Wild, Joker Poker, Double Bonus Poker, Aces & Faces, and Jacks or Better. Plus, you get the option to choose multi-handed, single, or pyramid play modes. In addition to slots and video poker, this online casino has lots of other options, including traditional versions of Baccarat, American Roulette, European Roulette, Caribbean Poker, Oasis Poker, Pai Gow Poker, Top Card Trumps, Blackjack, and Craps. For players who are searching for a different kind of fun, this establishment offers a collection of specialty games providing excitement along with the chance to win big. Specialty games fall underneath unique headings such as Virtual Racebook, Skratcherz, and Crazy Keno. What could be better than a generous welcome bonus to start off your membership? 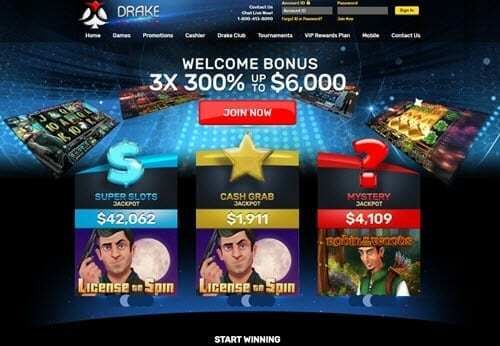 The Drake Casino’s 300% Welcome Bonus offers an incredible value up to $6000 on your first 3 deposits, each of which can earn a bonus valued at $2000 a deposit. One of the benefits of this type of welcome bonus is that you don’t need to place all of your money down on your initial deposit. Instead, you can spread it out across three individual deposits while still reaping the incredible benefit of $6000 as a bonus. All new players automatically receive entry for the Red Diamond Bonus, an incredible offer that provides access to 100% of every deposit they make at this casino. This bonus tops off at $500 and comes with the ability to power up to the next level for even better rewards. A varied collection of additional bonuses are available throughout the week. All players need to do is visit the promotions page, where they can find information on weekly bonuses, Monday spin specials, and more. A special Rewards Game of the Month is also offered along with weekly guaranteed tournaments. Drake Casino is readily accessible on most mobile devices, including Windows, Blackberry, Android, and iOS devices. Just use your existing account information from the web version to log in or you can set up your account directly from your mobile device. Finding ways to make your casino deposits is easy at Drake Casino. This establishment accepts all of the following methods: Neteller, Skrill, prepaid gift cards, bitcoin, QuickCash, Direct Cash, Visa, and MasterCard. With quick processing for withdrawals, it is easy to cash your winnings out using bank wires, Neteller, Skrill, QuickCash, Direct Cash, and checks. Every bit of sensitive data goes through 128-bit SSL encryption to keep the information out of the hands of unscrupulous individuals. Personal information is kept private, ensuring the safety of your financial details as well as any other information you might provide. The website’s gaming platform is audited by an outside organization to test for fairness. Moreover, every test is designed to keep up with the latest standards set forth by the Alderney Gambling Control Commission. As to be expected, Drake Casino is not in a position to take on members from Syria, Somalia, Sierra Leone, North Korea, Nigeria, China, Israel, Myanmar, Libya, Antigua and Barbuda, or the Netherlands. Oddly enough, despite the fact that the casino gets its operating license from the government stationed in Curacao, it cannot accept new members from there either. Staff are quick to respond to most queries and are available seven days a week. Unfortunately, live chat is not accessible between midnight and 9AM. If you live in North America, you can use a toll-free number to call. Plus, the casino offers four email addresses for contact ([email protected]).